Do you know the story of the lost colony of Roanoke Island? The legend of Roanoke Island has been passed down from generation to generation since 1590 when a group of 120 English settlers mysteriously vanished. In the late 1500s, the English made their first attempts to settle in North America on Roanoke Island, which is off the coast of North Carolina. These first settlers ended up returning to England because of a shortage of food and Indian attacks. In 1587, a second colony was founded on Roanoke. It was then that Virginia Dare, the first baby born to English parents in North America, was born. John White, the leader of the colony, went to England to get more supplies. When he returned in 1590, the settlement was deserted. All the settlers had mysteriously disappeared. The only clue he found was the word "Croatoan" carved in a tree. To this day no one knows what happened to them. It's possible that the Colonists joined with the friendly Croatoan natives. Or were they massacred by the unfriendly Wanchese tribe? No one knows for sure. 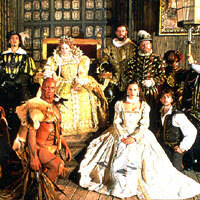 Since 1937, this mystery has been relived every year in a play called The Lost Colony. It is performed outdoors at Wayside Theatre at lth Fort Raleigh in North Carolina.